Aamir Khan, whose Thugs Of Hindostan has set the box office on fire with its opening day collections, opened up about his role in the film and said he lists the character of Firangi Mullah as one of the most difficult roles he's played so far, reported news agency IANS. Aamir Khan, who will co-host a radio show for a week, also provided an idea about who Firangi Mullah is and said: "It is one of the toughest roles I have taken up. Not only this, but this is a very unreliable character who can do anything at any time especially for money, and this is entertaining and fun to watch." 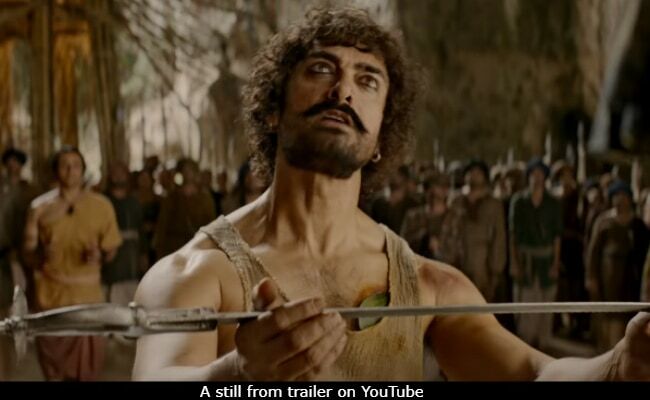 In Thugs Of Hindostan, Aamir Khan's Firangi Mullah is a conman who infiltrates an army of thugs to leak out information to the East India Company. Sharing his experience of working with Amitabh Bachchan for the first time, Aamir said: "It is the first time that we have shared a screen together. I am a huge fan of Amit Ji. Infact, I was so nervous for the first shot. It's been like 30 years and I was really looking forward to work together. He is such a warm and generous person, and I loved working with him," reported IANS. Amitabh Bachchan plays the role of a mercenary named Khudabaksh, whose sole aim is to free India from the shackles of the East India Company. In his review for NDTV, Saibal Chatterjee summed up Aamir's portrayal of Firangi Mullah and said: "Aamir Khan, complete with kohl-lined eyes, ear rings and a nose pin, slips into the skin of a shifty Firangi Mallah, a duplicitous mercenary who thinks nothing of repeatedly switching sides for a few guineas more. His character is placed here as the counterpoint to the imperious Khudabaksh. Betrayal is the man's defence mechanism." Thugs Of Hindostan hit screens on November 8 and opened to mixed reviews. The film however raked in an opening day collection of as much as Rs 50 crore, as was reported by trade analyst Taran Adarsh. In doing so, the film has soared to the top of 2018's list of films with highest opening day collections. Directed by Vijay Krishna Acharya, Thugs Of Hindostan also stars Katrina Kaif and Fatima Sana Shaikh.